Rejecting people is just as heartbreaking as getting rejected. As much as possible, we don’t want to hurt or discourage the people we are rejecting, but it is a must if we need to follow the rules strictly. Fortunately, to save you the hassle, we are offering you with a wide range of Job Rejection Letter on our website. From follow-up rejection letters to credit rejection letters, we have it in store for your convenience. Now, you won’t have to worry too much on how you would reject those applicants who applied for a credit without making the news too much for them. To learn more about credit rejections, continue reading on. 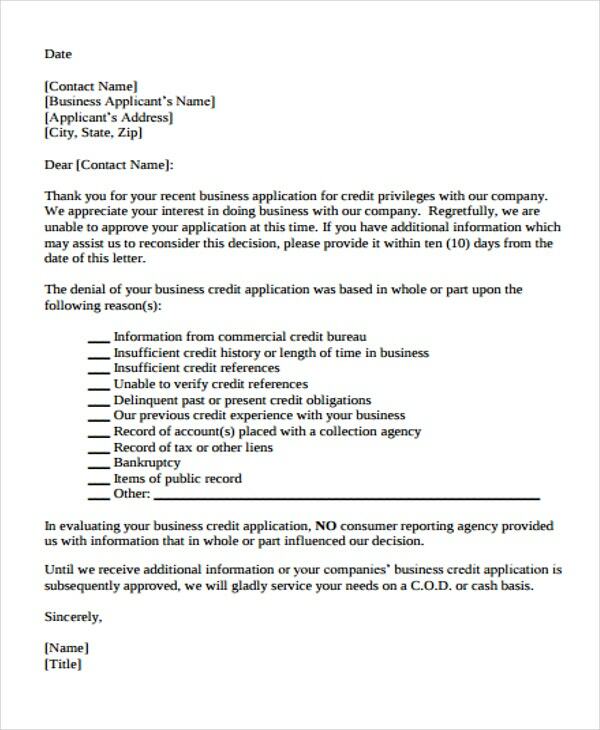 The first paragraph should acknowledge that the application for credit was received by you but inform the applicant that the application for credit has been declined. 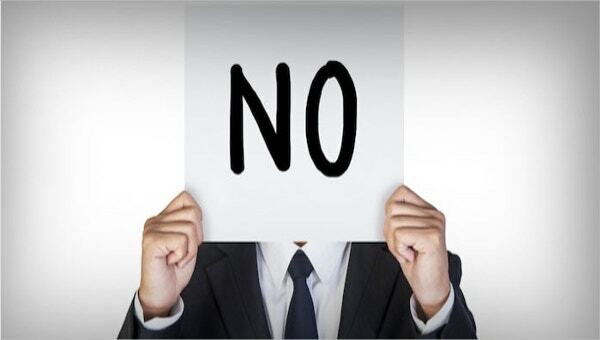 Provide the applicant with supporting reasons behind the rejection of their application. This is to soften the blow while, at the same time, the client may plan ahead on what their next moves should be next. 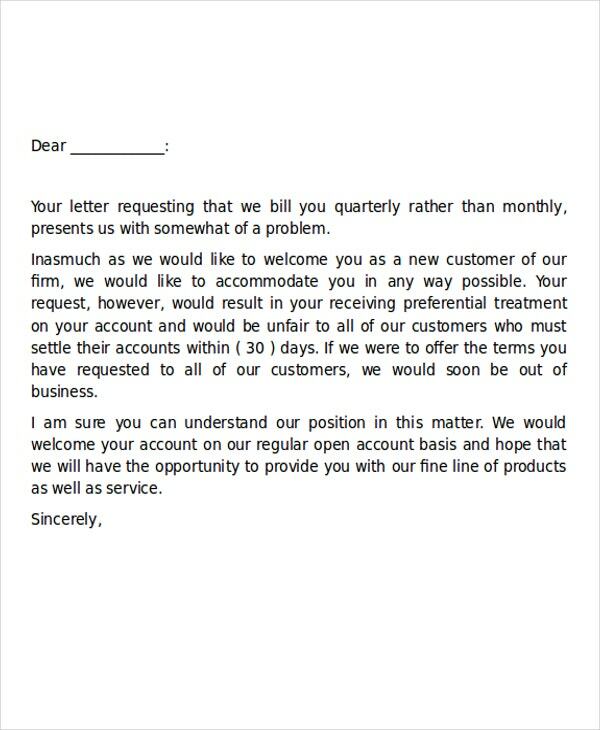 Make sure to use professional and polite language throughout this letter. 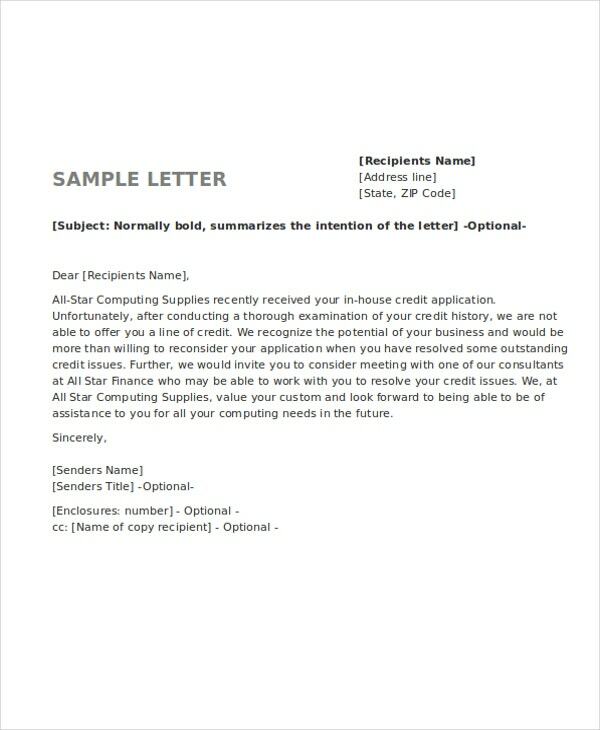 On the next paragraph, however, provide the applicant with a suggestion on what to do so that their application may be approved the next time they apply for credit. Finalize the letter by signing off on the last part of the rejection letter. For another type of rejection letter, you may want to check out our collection of Grant Rejection Letters. 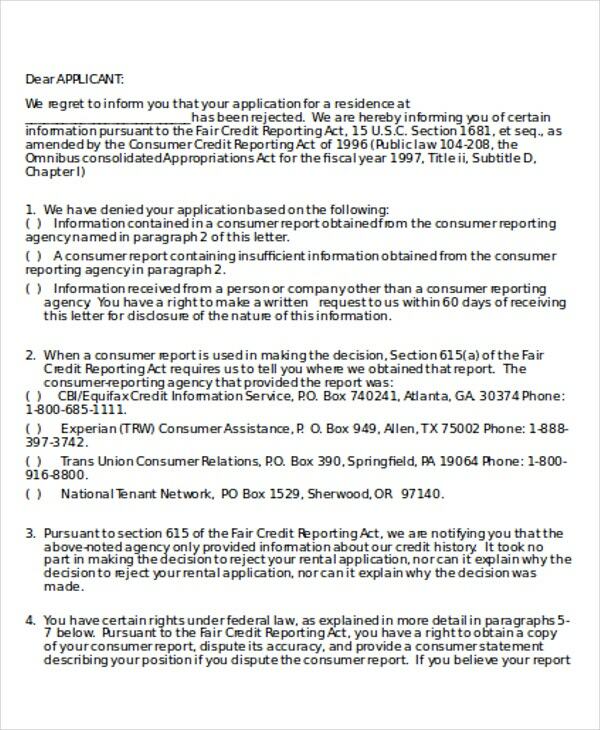 Why Are Some Credit Applications Rejected? Their balance level is significantly greater than what their credit allows. This can only be fixed if they settle in paying their balances first. Their credit score has decreased because of their failure to settle their credits consistently. This can be resolved by focusing to make their subsequent payments on time. Their credit scores were affected because they haven’t used their credit card for a long time. As long as they use their credit card occasionally, their credit scores will be good. For rejection letters to job applicants who didn’t make the cut, you may also want to check out our collection of Employment Rejection Letters. What Advise Should You Give to an Applicant Following a Rejection Letter? Tell them that they can apply for credit again in the future, but urge them to comply with all the requirements to avoid getting denied again. 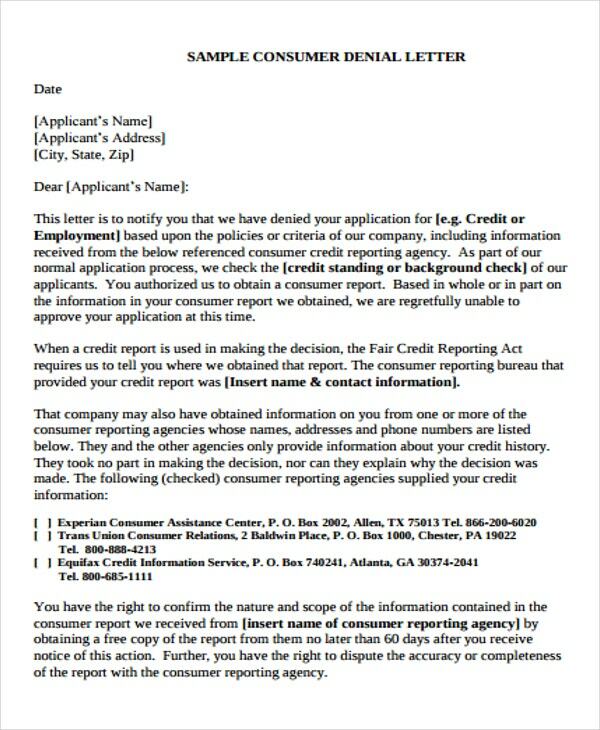 You may offer the applicant a copy of their credit report for them to review for any inaccurate information. Suggest to them that they should have their credit fixed as soon as possible. You may also suggest to the applicant to get a secured credit card instead to avoid making expenses that go beyond the credit’s limitations. For more employment-related rejection letters, these Job Application Rejection Letters are here to save your day.